Soccer tennis, one of my team's all time favourites! This soccer tennis is a fun soccer game you can do with 2 or 4 players preferably. It gets the players to work on their touch of the ball, balance, and communication all in one. - For soccer tennis, the grid size can vary. Typically set up opposing 5 by 7 yard grids, but adjust based on your teams foot skills, and adjust if you do 1 v 1 or 2 v 2. - Set up teams in a King Court format, with each winning team moving up towards Kings Court. - Ball must cross middle line above the waist. - Players must make a minimum of one pass to partner before crossing to the other side. - Each team is allowed to let the ball bounce a maximum of once prior to playing to the other team. - Serves can vary, but typically must be behind end line and as a half-volley. - Points can be awarded every time, or only for serving team. 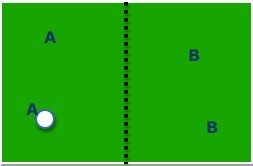 - Example: Player A serves to team B, receiving team allows one bounce, juggles the ball and makes 1 pass, then plays ball back over middle line to A, lets it bounce, passes and plays back over, and proceeds until a point is scored. - Players should always be on their toes ready for the incoming pass. - Players should be well balanced when playing the ball. - The juggling works on their touch and control with the ball. - Reduce to 0 bounces allowed on each side. - Limit to feet only are allowed. - Adjust grid size smaller. - 10-20 minutes for this soccer tennis game.